UPDATED 12/1/2018 at 7:05PM EST the best 2018 black friday deals are over but this AMAZING Amex deal is being heavily promoted by Amazon again which you can use for more Holiday presents. I just got targeted so you should check again ASAP!!! Not targeted still? Check below for 3 other methods! Do not have an Amex? See below for the best Amex card for you or click right here to check out their full line up!! It is not working with gift cards (at least for me) but its working with items sold by Amazon – in this cart i put two of the most popular items readers buy Fire HD 10 and iRobot one of the newer models (which alone is usually $500 i got both items for $400)!! You do not need to spend it all in one order you can order $75 of stuff today, $200 tomorrow etc however hurry as this ends for sure by 12/23 or Amazon could end it any second. See below for lots of great items you can stack to get up to your $500. Note: Many of the best deals are STILL available, for example, its a great time in particular to get Toys. Wait Until December to Buy Toys – Black Friday and now Cyber Monday have a lot of deals on toys, but you should hold off until the middle of December. Prices always fall even lower around December 10, and you should be able to save even more. Do not wait too long, however, as we view the sweet spot to buy toys from around December 10 through December 18. Shopping any later and you may find most of the good toys are already sold out. Furthermore, Amazon is running more deals starting 12/3, however, this Amex deal ends 12/23 or whenever Amazon or Amex want so do it soon before it closes out. See these screenshots for updated details – what will you buy? Tell us below in the comments! UPDATED 11/26 at 10:43 PM EST UPDATED with some of the best 2018 black friday and cyber monday deals. Scroll down and act now because these sales end VERY soon. I spoke to Amex and in certain cases they can help you get targeted for certain offers like the ones above – call 1-800 327 2177 and let us know if you have any luck. Amazon sent us a few new deals they posted including one from Amazon! Some good news on your Best 2018 Black Friday deals at Amazon – this offer stacks so whatever great deal you find take 20% off that! You can STACK this offer with other deals!! You now have several ways to try this if step #1 doesnt work try #2 and then #3 etc. and we have four methods to hopefully get this working so you get the best 2018 black friday deals right here and now. This post was updated on November 26td at 14:38M EST with 2018 Black Friday deals over but Cyber Monday is here. Therefore, please check back for more discounts as we update throughout the next few days! Firstly, check here for 20% off via AMEX f– this SMOKING hot deal from PRime day is back for Black Friday 2018. If you are targeted you will receive an additional 20% off at checkout when using one AMEX point, after you activate the promo here. Morever, if you aren’t targeted you can try linking your Amex with your Amazon account here and then check back after a few days. To clarify, you read that right and this amazing deal actually works – don’t believe us?! 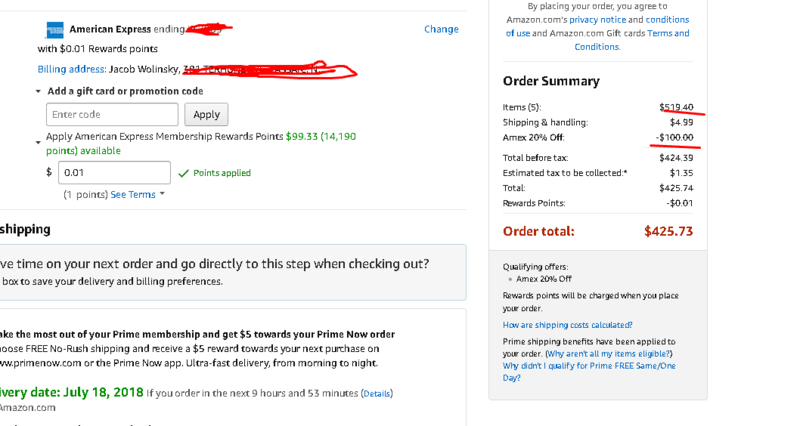 To clarify, this is what it looks like I used a $400 AMZN gift card and $50 uber card as part of this order when this deal was offered by Amazon on Prime Day. Too lengthy sifting through thousands of 2018 Black Friday Deals? So, no worries here are some editor’s picked deals after we searched through thousands of them from Amazon and other places for the BEST ones. HOT! HURRY! Get $10 Off Anything From QVC! So, are you a book worm? See our 2018 Black Friday deals on books from famous investors below. Finally, VALUEWALK participates in the Amazon Associates Program: To clarify, we earn a small percentage if you purchase an item (we have no idea who purchases what) from our 2018 Black Friday deals. Additionally, each of your purchases via our Amazon affiliation links supports quality journalism at no additional cost to you.